Story is as much a part of us as our bodies are. Each of us is a unique and varied novel ripe with chapters about where we came from. Who we are. Our dreams and hopes and wishes and fears. Our mundane everydays and our wild and crazy adventures. We have interspersed into our pages heartaches and celebrations, triumph and turmoil. There are things we are proud of and others we most certainly are not. But they are our stories nonetheless, and whether we write them with monotony or fervor, the inkwell of the pen of our life never truly runs dry. The nib will never fray or get worn. We are history. Living. Breathing. Being. We are the torn and creased and battered and pristine pages in the most perfect book. Story is the reason I’m a photographer – I have the ability to capture a moment that will instantly jog the memory and bring someone back in time. A second or a year or a decade past. A photograph is to the memory what the card catalogue was to the library. It’s an incredible piece of a beautiful and much greater whole. It’s the beginning and the middle but never the end, and that’s what makes it magic. Because I recently surpassed 1000 ‘fans’ on my Facebook page, and because I promised a giveaway, I’m officially announcing the Story Sessions. An intimate portrait session with you – yes you! – and whatever is necessary to adequately convey the context of your story. I want to capture your beginning. Your middle. And okay, even what you think is an end, and create for you an image and/or series of images that will take you back to any chapter in your life that needs chronicling. Cataloguing. Archiving. A summer spent in the BWCA. Childhood best friends. You – for no particular reason other than the simple fact that today – that right now – will only happen once. Your child and their lovey. Siblings. An adoption. A divorce. A reconnection. You father’s hands. The way your mother looks right. this. moment. Whatever your story, whatever the portrait, whatever your reason, and whatever your history; I want to hear what makes you so beautifully you. I want to give your path paving stones instead of breadcrumbs. Because time is a fickle thing. And it’s a cruel thing. And it will steal even the most wonderful and beautiful things from us. Quickly. Efficiently. Without warning or apology. It will steal from us the smell of our newborn child, snuggled milk-drunk on our chests. It will destroy the sound of childhood laughter swirled up in wind and summer rain. It will muffle the buzz of streetlights electrified and magnetic in hot, summer air. The creases on our grandparent’s hands. The magic in our mother’s eyes. We think we will always remember these things. But the truth, darlings, is that we won’t. The smells and the sounds and the feelings will fade. They will be carried to sea on the tides of time and we won’t even be left with a footprint in the sand. Unless we document them tangibly. Legibly. Permanently. So tell me your stories. Tell us your stories. Leave me a comment on this post (or, if your story is too personal to share, contact me and I will share your story anonymously) with what you would want documented in a Story Session and why, and I will choose one story to document in a personal portrait session. You have until midnight on Friday, February 28th to enter. The only rule is that you be available to the Twin Cities metro area. You don’t have to live here, but you do have to be willing to get here. Good luck, loves! I can’t wait to hear your stories. This isn’t something I would normally do, but I also feel like if I don’t start taking the time to reflect upon where I am in my life right now it will be a wasted opportunity. I ask that this is shared anonymously since I’m not certain I want this accessible to everyone just yet. So, here’s my story. After reading your blog post about story sessions and thinking about what my own could entail, I kept coming back to a Cheryl Strayed quote: “we’re all just walking and walking and walking and trying to find our way, that all roads lead eventually to the mountaintop.” More than anything, I feel as though I’m about to change roads. I’m feeling stuck on the one I’ve been traveling, but grateful for where I’ve been. I’m in my mid-late twenties with a stable job, loving boyfriend, fantastic roommates and I’m generally happy, but if I’m being honest, I’m feeling stuck. I’ve decided that this is the year where I live more intentionally and make decisions for me and what I want in my own life. I see friend after friend celebrating weddings and engagements and children and new fancy jobs and while I want all of those things, I don’t want them now. It’s hard not to get caught up in how I’m ‘expected’ to be living. I want to celebrate the person I’ve become even when that’s not easy, or not who I expected. I want to celebrate the people who have made me who I am today, for better or worse. I want to celebrate my 90 year old grandfather who has taught me about love and devotion while caring for my grandmother with Alzheimer’s. My mother who is a silent pillar of strength and makes the best of every situation. My father who despite his flaws, has taught me the value of empathy. I want to capture where I am right now. I want to remember this change and momentum. I want to commemorate the relationships that I have with family and friends that may not exist in the next five years. I want a photograph with my mother because I don’t have any. I want to find strength and courage in uncertainty and document this feeling in a different way than text or thought or my own creative pursuits. I don’t know exactly how to show this story, but I really hope that I’ll be able to with your help. I’m writing to you today because I have a story to share. This story involves lots of different countries, languages and events yet two people connected somewhere along all this… my dearest friend Mary and I. My soulmate-friend. Right from the beginning it „clicked“ and has stayed that way for the past 10 years! Even though we have spent most of our life apart from each other, we have become really close. We first met in 2004 when we both lived in Spain – me with my family because of my father’s job, Mary because she spent a year abroad during high school living with our Spanish neighbors… so this is how we met and where we bonded over our mutual love for travels and languages, singing Dixie Chicks songs at the beach, aged 16 and 17… we had a grand time living next to each other, seeing each other every day, cooking and baking up a storm, dancing around the house, playing board games, doing crazy photo sessions and traveling together. Since then we have never lived on the same continent again yet we stayed in touch over the years. We managed to see each other every other year (more or less). We managed to grow our friendship and ever since that first year of meeting we called each other soulmate-friends. It has been a very special friendship and I appreciate my dear Mary so much! Her family calls me their third daughter and I call them my American family. We have shared ups and downs, saw exotic places together, took a road trip from Seattle to San Francisco and this year she is getting married! I will be by her side as a bridesmaid. I am so excited for her and her fiancé and their next chapter together. STOKED actually! All along we took pictures during our times together, sometimes friends or family would take a picture of us together, or we managed to get a nice selfie…. but the outlook of a real photographer capturing this special connection we share adds another level to this! We both love to laugh. We’re not shy. We both love to talk and sing and communicate. We love road tripping and exploring. We’re both very affectionate girls. Yet we couldn’t be more different when it comes to our look (she is a beautiful tall red head and I have very curly brown hair…) and our careers (she majored in Spanish and translation and I’m about to finish medical school). I’m sure we would have a lot of fun with you and in front of your camera! Ever since I found your blog I have been in awe with your photography and they way you capture the essence, the people, the story. It would be an absolute honor to step in front of your camera and let you grasp a little bit of our story. I would love to plan a stop on my way to the West Coast (for the wedding! Eek!) in the twin cities metro area this summer and meet you there! What a great opportunity. Totally willing to get there! I’m in, entering your lovely story sessions giveaway! And even if we don’t get to jump and dance in front of your camera, I’m really appreciating the opportunity to write to you and get it all out in my own words. Also, I have been wanting to comment more or send you a message about how wonderful your blog is, so this is a great opportunity to finally do this… this is my way of signaling from the big, anonymous internet world that there are indeed individuals behind it, looking to you from the other side of the Atlantic and enjoying what you do and share. A friendly shoutout saying: YAY! Cheers to you Athena! I’ve totally been staring at the screen trying to type something but unsure about what to say. I’m not sure how you would do this but I would love to tell my journey from a little girl growing up in a broken home to who I am today. I take my roll as a mother seriously and get down on myself when I make mistakes due to the fact that I had a natural mother that left me and then a step mother that I was never good enough for. I can not imagine my life with out my kids! I’m excited but nervous for the future, what I will learn, the challenges I will face, and the joys I will experience only as a mother can! Who we are today is directly related to how our childhood was. Whether we had an amazing one and want to pass that down to our children or we had a hard childhood and want just the opposite for our children. This is a personal story. Although I’m not a story teller like you, I feel there is a need to document the who I am now. After experiencing the summer from hell-The blow up, the fight, the separation, and the final blow– divorce. and the never ending battle to the road called freedom. Remaining strong for myself, and for the 4 amazing kids that look up to me on a daily basis can be a struggle. Everyday is a new day. Sometimes I’m only able to travel by minutes. Somedays I wish I could just disappear for all eternity. Non-the less, I’m still here, I am strong, independant, and more resilliant than ever. I’m bound to not let this divorce rip me apart, rather I intend to flourish from it and come out the other side, happier, stronger, and a redefined me. What it takes to be a mom of 4….. is still to be fully decided, I’m living in a tornado on a daily basis while raising my kids and 5-7 extra kiddos during the day. By night, I slow down enough to catch my breath slightly, I change hats and focus on love– thru my lens. The fact that love is still present and noticeable in my state of mind is inconceivable. But there is still hope that someday I may find someone to love, and someone who will love me back in the ways that I deserve. As the beatles song plays in the background. Obla-di-obla-da life goes on. One foot in front of the other, with my head held high, I find there is a need to document the inner strength that I am feeling now, at this very moment. It’s real, it’s raw and it’s happening to me ~ something I never in my wildest dreams ever thought I would experience!! Yet. There is hope for happiness on the other side. It’s hard to translate raw emotions and I’m not a good storyteller by writing, but here is my story. I grew up with a very loving (large) family. I had parents who worked hard and tried to give us what they could, even if it wasn’t much. But I knew and showed I was loved. I was a child who, due to some circumstances, got picked on as a child about a physical attribute. If you’ve ever been picked on as a child, you know those scars stay with you no matter how old you get. I told myself that it would make me stronger to overcome the criticism. I would make something of myself in life. I had my first child when I was still ‘young’ and got married. Life wasn’t easy, but I did the best I could. But I struggled. It seems like that’s all my life has been…one struggle after another. I told myself that no matter what, I would be the best mother I could be, have my child know that they are loved. Even if I couldn’t always love myself the way I know I should. The marriage didn’t work out. A lot happened that is too personal to share, but it broke me inside in ways that I never knew were possible. It created a lot of self-doubt and even less self-esteem. I learned to hide all my emotions and pretend that everything was ok to make it through. I unfortunately, got really good at hiding emotions and true myself. I put own needs last, consistently. But I kept telling myself that that is just what all moms do; they put themselves last. Deep down I know it’s a lie, but for a while it helped. Life goes on, bills stack up, and children grow up. The world doesn’t care how much you struggle. I worked hard after the divorce. I vowed to be the mother my child would want to look up to and be proud of. I would be a part of my child’s life and give them what I didn’t have growing up, even if it meant sacrificing something else or literally counting pennies. I worked hard at my job. When I wasn’t working, I spent all my time encouraging my child to be the best she could be. That hard work would pay off in life, even if you didn’t see it right away. I hope that as time goes on in the future, I! will find out if my hard work and determination has paid off in that respect. In my own personal life, many years later, I met a man. This man makes me want to become a better person every day. He sees and brings out the best in me. We bring out the best in each other. I’ve never known this type of real unconditional love. He loves my child as his own. He has given (physically) a piece of himself to his father so he would have a chance to live. That was the best gift that anyone could ask for in a life. That is genuine love. But he has also shown me that I still struggle to completely love myself. After what seems like my whole lifetime, regardless of how much I try to overcome it, I still have the same insecurities. To me, when I look in the mirror, I see all the struggles written all over my face. I see and feel the past; being picked on as a child, the criticism and heartache, sorrow, the seemingly endless struggling. It all seems to just sit there and stare back at me. That is not how I want to be. I want to stop seeing the past written all over my face. I don’t want to waste anymore of my life like that. I want to see and feel all the blessings I do have in my life. Completely. Without a doubt. To see hope, faith, and optimism documented so I have that physical reminder of truly loving myself. I recently lost my grandmother. She was like a second mom to me and she exuded self-confidence in a way that you could see and feel one hundred and ten percent of her true self, her heart, her love – from the inside out. I loved every wrinkle on her face and hands and the look in her eyes. It showed her life. I want my own children to see the same from me. I hope I get the chance to have a permanent reminder to show myself as well as them. The story I would like to share is a very close personal journey that is still fairly new. I am a girl who came from a home where my parents were not together and there wasn’t much involement of my father in my life as I grew up. Three years ago I had a beautiful little boy, his name is Zander. His father and I were together for 3 years and it wasn’t the greatest relationship. We faced many struggles. In the end the struggles were to big for us to overcome together. His father faced many issues with drug and alcohol abuse. When Zander was one we split up and went out seperate ways. With the problems he was facing with his addiction I did not allow him in Zander’s life. I was too frigthened. In one year’s time Zander only seen his dad a handful of times. Things were far from ok with us co-parenting together. There was a lot of hatred and hurt feelings that were left unresolved between us. Throughout that year I remember thinking constantly, to the point of being sick, that Zander isn’t going to have HIS dad in his life. That thought scared me more than I can even put into words. It brought me back to my childhood. Constantly wondering why my dad didn’t want to be in my life. I refused to put that kind of pain in Zander’s life. I was hoping for a miracle. In October 2013, Zander’s dad re-entered his life. We came to a mutual agreement through mediation services on a schedule for Zander so he can have a relationship with his dad. Since March 2013, Zander’s father has been sober. For that I am beyond grateful! It is coming up on one year for him. His father is also married. That was something too that was hard, only as a mother, for me to face. Is this woman going to try to replace me as a mom? Is she going to be kind and love my child? There were so many thoughts that ran through my mind with that. Luckily, we have all united together as friends for Zander. He is what is most important. Him knowing he is loved by each of us and knowing we will always be there for him is what matters. With that, capturing where we all are today, for Zander, would be amazing. Knowing where we all started to where we are today is heart warming. Capturing moments of all of us together and for Zander to have all these memories saved for him would be amazing. There are so many families that are split and I want to take this opportunity to show that it isn’t always a horrible situation. I am thankful that we have found a way to come together as parents for our son. At a time in life when chaos met passion transformed my life, but along with regret. Whether to thank serendipity or luck- the pregnancy and birth of my daughter changed my life for the better at a time when I needed her most. She saved me and gave my life meaning and unconditional love. When I found out I was pregnant, I considered abortion and adoption, because at that point in life, I was alone and did not know if I could take care of myself, let alone someone whose life depended on me. I kept her pregnancy a secret for the longest time, being embarrassed and ashamed. I was still in college fighting two different spheres of life, maturity, or the crazy world all my friends were experiencing. I was not with her father whom a couple of years later became my husband and I have her to thank. He was fighting personal struggles, living in another state, and did not know if he wanted a baby. Secrecy was the easiest of option when faced with unknowns. I resent how I handled my pregnancy when I know how she changed my life for the better. The well-known phrase of “I wish I knew then what I knew now” teases me to this day. I look at her she is the best thing to happen to me even though at the time she was hidden away. I wish you would show the story of Emerson, the little girl whose name means Brave because she is everything I couldn’t be. I hope for you to show a beautiful spirit that is anything but ashamed or embarrassed to face the world as I was pregnant with her. She does not know how I hid her, unlike most proud, pregnant first time moms, but I want her to know how amazing she really is. She knows she is special to me, so maybe this is for me who lives with this resentment. I hope you could show how a little girl gave two people’s life meaning and brought them together w at the time hope could not do it and for you to fall in love with her as well. I would like to tell the story of three unmarried women: me, my mother, and my grandmother. Whether it’s boyfriends broken up with, husbands divorced, or a husband who died, we are now the trio that supports each other. I have watched my mother and grandmother relearn how to be a strong individual at each milestone of life. They have redefined themselves as they moved across country, moved to senior living, and prepare to move still more new places. And I’m redefining myself and moving forward in my life too. The cycle of caring for each other physically, emotionally, spiritually is such a part of life, I never really saw it as a story until I thought about who I would most want to be in this storytelling with. And it’s Me, Mom, and Grandma, telling about how we made it back then. Are still making it now. still facing life, laughing and singing and dancing and holding hands with each other every step of the way. Our dinner time table talk is one of my favorite things right now. I got Quinn out of his chair and carried him sideways and side hip to the kitchen sink. He put his hands in the water to wash them and then without skipping a beat continued his ritual. He leaned his head down in to the sink and turned his face towards the water. “Face too!” he said, as he smiled and ran his face in to the stream of water. He took a few sips and then was off to dry his hands and face. The towel that hangs on the oven handle often sits squished in it’s spot, a result of a little man intent on putting it back in it’s place with the shove of little hands. Quinn had time to watch 15 minutes or so of a show. 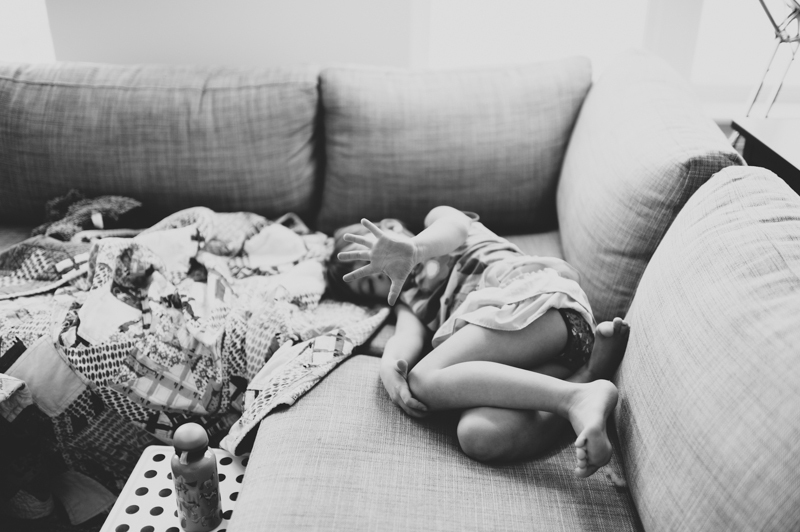 He and Pete slouched in to the corduroy couch and became twins as they soaked in a little “Wild Kratts” before bed. Just before the show finished I laid Quinn across the ottoman and got him changed and ready for bed time. We zipped up his moose covered footsy pajamas and were ready to go. “Mama you get my water?” “Yes Quinn, I’ll get your water.” “Mama we go upstairs?” “Yes Quinn. Say good night to Daddy” “Good night Daddy” as he did the slow sleepy time walk to the stairs. “Say I love you” “My loves you Daddy” Pete called back, “I love you Quinn” And up the stairs we went. As Quinn sleep waddled to turn off the lamp behind the rocker, I prepared his bed for him to get snuggled in. He climbed in to bed, got under the covers, smooshed his face around on his pillow and as per his ritual asked for a drink of water. I gave him a sip from his cup, placed the cup back in it’s spot next to his bed and laid down next to him to finish out the routine. I sang Quinn his song, Buckaroo, a song written by Aunt and one of his favorites. I stopped in between versus to remind Quinn to close his eyes. The song finished and we laid there a few minutes longer while Quinn drifted off to sleep. I closed my eyes as well and drifted off listening to the rhythm of his breathing. Once the babe was asleep I crawled out of the bed and quietly stepped out of the room, gently turning the knob so not to wake him. The door closed and I crept down the hallway. Sweet dreams dear child, sweet dreams. This is what I want you to capture, before it becomes a memory.